Epiphone Limited Edition 2014 G-1275 Double Neck - "A legend for a reasonable price"
Epiphone G-1275 Custom - "It's BIG, but good for Led Zep fans!" Danelectro Doubleneck Standard/Baritone Guitar - "Cool guitar!" 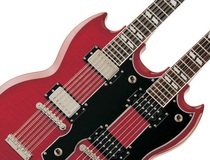 Gibson EDS-1275 Double Neck - "Gibson SG Double Neck"
Maestro double manche - " a monster in a guitar"